It’s been 340 years since the immortal highwayman Claude Duval (or Du Val, or Du Vall) went to the Tyburn gallows and was turned off into legend as the ne plus ultra of English gentleman thieves. Duval, actually, was French, an import to Isles in the train of some forgotten noble migrating with the restoration of royal prerogatives. William Powell Frith‘s painting (1860) of Claude Duval dancing with his prey. how his vivacious gallantry stole away the hearts of all women; how his dexterity at sword and pistol made him a terror to all men; how, at length, in the year 1670, he was seized when overcome by wine; how dames of high rank visited him in prison, and with tears interceded for his life; how the king would have granted a pardon, but for the interference of Judge Morton, the terror of highwaymen, who threatened to resign his office unless the law were carried into full effect; and how, after the execution, the corpse lay in state with all the pomp of scutcheons, wax lights, black hangings and mutes, till the same cruel judge, who had intercepted the mercy of the crown, sent officers to disturb the obsequies. In these anecdotes there is doubtless a large mixture of fable; but they are not on that account unworthy of being recorded; for it is both an authentic and an important fact, that such tales, whether false or true, were heard by our ancestors with eagerness and faith. 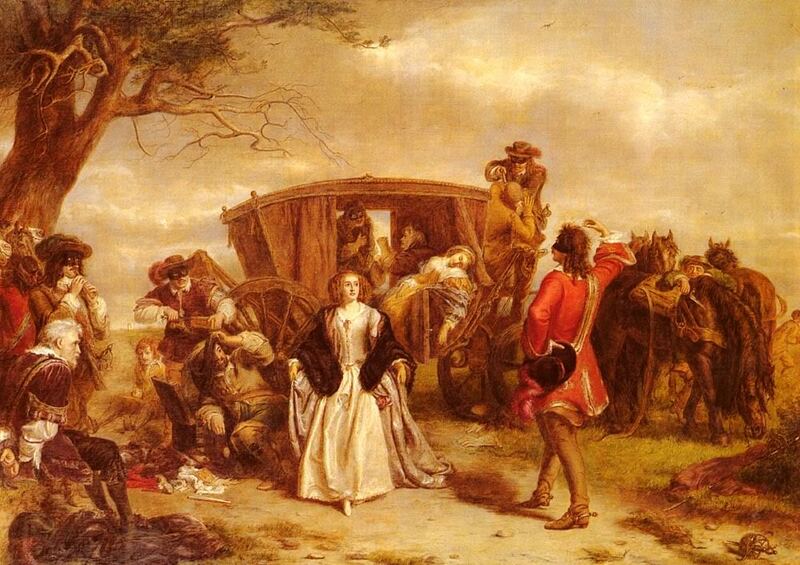 Gillian Spraggs justifiably observes that no matter how genuinely gallant the brigand, his profession entailed relieving others of their rightful produce by main force. But then, the same could be said of the lords of the realm. No, although Duval’s legend invites debunking, this must be for another blog. We take Duval here at his mythological acme: he is the patron saint of the early modern bandit, the Superman of English outlawry, succoring with the fantasy of freedom upon the road the thousands of porters and scullery maids and apprentices chained to their oars below-decks upon Britannia’s ship of state. Knights to his arm did yield, and ladies to his face. Du Vall, the ladies’ joy; Du Vall, the ladies’ grief.